The Big Lead posted this earlier today, but it needs to be a part of the Offbase family of videos that make you want to strangle an old lady. Pay particular attention to: Darryl Strawberry in the No. 2 hole, and of course Rafael Santana at the 2:08 mark. Santana's performance rivals the work of Luis Zendejas in the Philadelphia Eagles' rap video "Buddy's Watching You". Zendejas comes in at the 1:02 mark. 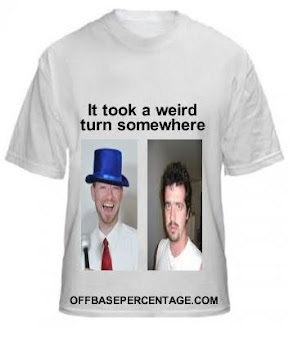 That brings us to the first-ever Offbase poll. Vote on the right side of the site: who put on a worse rapping performance, Santana or Zendejas?